Certain Dri Antiperspirant is a product I saw success with early on in my life. I started using it in middle school after noticing that I had a huge problem with underarm HH. My underarm sweating caused me a lot of embarrassment in school and I was very unhappy. After using the Certain Dri roll-on, I started noticing results pretty quickly. Underarm sweating didn’t occur for three days at a time. Continued use of Certain Dri proved 100% successful for me. I no longer suffered from sweat stains reaching the hem of my shirt and felt more comfortable wearing lighter colored shirts. Certain Dri has greatly improved my quality of life and I recommend this product to all my readers who suffer from excessive underarm sweating. Recently, Certain Dri found my blog and approached me because of my success with their product. They have offered a unique opportunity to you, my readers. Thanks to Certain Dri, I have been offered a chance to host a giveaway of Certain Dri product- an antiperspirant in your choice of a roll-on or solid. The giveaway will take place from Monday, July 8 to Wednesday, July 17. CLICK HERE to find out more information and to enter! A couple of months ago I was offered an opportunity to try an Iontophoresis machine for my Hyperhidrosis. 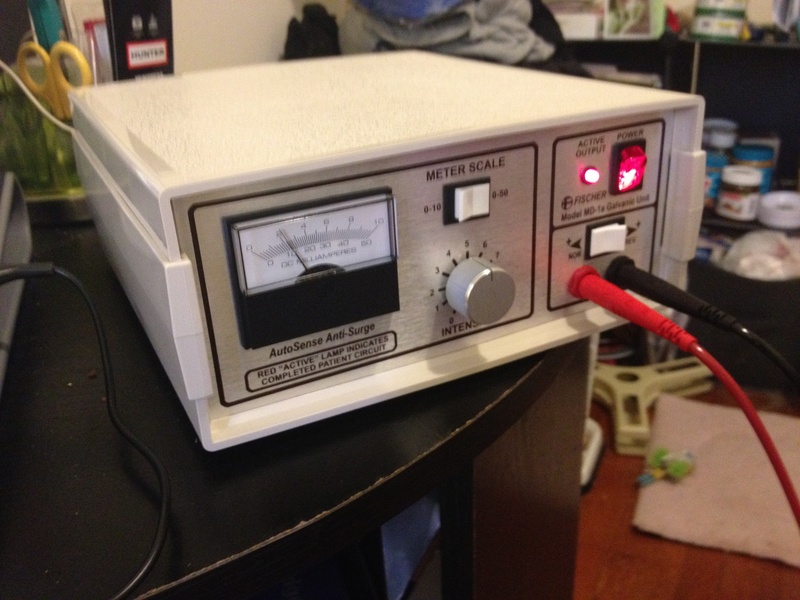 The makers of the R.A. Iontophoresis device loaned me a prescription machine- the MD-1a Galvanic Unit! I have been working with Bill Schuler, R.A. Fischer president and long-time supporter of the International Hyperhidrosis Society, over the phone and via email for tips and coaching and updating him of my progress. What is Iontophoresis, you ask? My first experience with this machine caused a lot of anxiety. I opened the case and saw a lot of wires and many booklets and sheets of paper with instructions. Francis and I read through all the directions, we set up the machine and prepared the trays with tap water. This being the first time, it took us about an hour before we actually turned the machine on. I’m glad we went through everything thoroughly because I felt that the machine could be dangerous to me if something was set up incorrectly. Francis used to work for the American Red Cross and I was happy that his medical instincts took over as he carefully made sure everything was hooked up properly. He let me focus on calming my nerves. I already knew the general idea of the device as I had tried Iontophoresis about 10 years ago with no success, but this machine looked a lot more intense. I opened the case to find that it conveniently slides apart to become two tap water trays. One metal plate rests in each tray and a cloth goes on top of the plates to avoid any direct contact with the skin. Each plate is connected by a wire to the main device where you change the level of milliamperes. The instruction booklet said that you should aim for setting the device to 12-18 milliamperes. Finally, after making sure everything was hooked up correctly, I was ready for my first test with the device. Each of my hands rested in a tray on top of the cloth covering the metal plates. We were ready to turn the machine on. Although I knew the machine was safe, I couldn’t help fearing that I would somehow be electrocuted and pass out once the power button was switched on. I could feel knots in my stomach and my breathing was fast. I was really nervous. During the first treatment, Francis was responsible for working the device and changing the level of milliamperes. He counted to three and he turned the machine on. Francis gradually increased the milliaperes to 12- we didn’t go any further than that on this first try. What I noticed most was vibration. The vibration was pretty severe during my first try- vibrating my fingers, palms, wrist, and half-way up my forearm. If the sensation was getting to be too much, I asked Francis to lower the milliamperes slightly. The vibration sensation was not painful, just a little uncomfortable. After ten minutes, it is instructed to gradually decrease the milliamperes to 0, reverse the charge, then gradually increase again between 12-18. This lasted for another 10 minutes, and then my treatment was done for the day! I was happy to find that the treatment wasn’t painful and that I felt safe. The treatment takes a lot of time, but I was able to watch TV during it. Watching TV also helped keep my mind off of any discomfort I felt with the vibration sensation. I was also relieved that Francis was with me for my first treatment. He was very supportive and protective of me and made sure I was feeling okay. After the first treatment was over, he wanted to try the machine to see what I was feeling! I let him try it very briefly, and we only went up to about 6-7 milliamperes. He could feel the vibrations from the plates. This really showed me how much he supports me and that he was willing to step into my shoes, so to speak. His actions spoke largely about his character. Stay tuned for another entry about my other treatments with the Iontophoresis device! 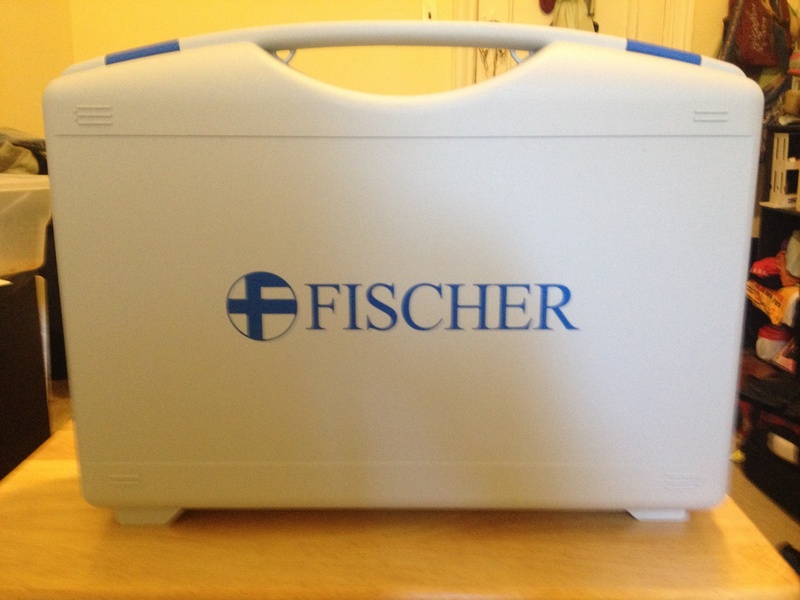 Carrying case for the R.A. Fischer Iontophoresis device. The case comes apart to become two tap water trays for the treatments. The milliamperes are adjusted on this device during treatments. During my first treatment, I treated both of my hands at the same time because Francis was adjusting the milliamperes on the device.